“Don’t be afraid of your hair. Just use it, it grows, it comes back, it’s like a garden.”Sam McKnight’s ethos sounds as deceptively simple as the “done undone” bedhead hairstyle that has become one of his trademarks. Somerset House’s current retrospective of McKnight’s 40-year career demonstrates how this playful approach has helped shape some of the most recognised fashion images of the past few decades. In a refreshing deviation from the majority of monograph designer shows, Hair by Sam McKnight foregrounds the backstage collaborations between editors, hair stylists, makeup artists, models, photographers, and manicurists who produce the “looks” we encounter on the catwalk, in magazines, and in public life. The art of styling hair seems to occupy a dubious place in the history fashion and popular culture. Early practitioners who achieved prominence in their time, such as Leonard Autié, Marie Antoinette’s hair-dresser, and Fanny Feifalik, who was in charge of Empress Elizabeth of Austria’s tresses, attracted both admiration and resentment for the influence they exerted over their royal clients. By the 1960s, fashion had become such a mass culture phenomenon that Vidal Sassoon, inventor of the five-point cut, capitalised on his celebrity credentials by building an empire of products and salons that survive to this day. The vast majority of hairstylists’ handiwork has gone largely uncredited, however—especially in fashion publications whose pages were traditionally dominated by photographers’ and designers’ names. It is only recently that more attention has been paid to the behind-the-scenes figures who shape trends at a most elemental level. McKnight’s retrospective charts this trajectory. As curator Shonagh Marshall reiterates throughout the exhibition, the rise of new digital platforms—and especially that of social media channels such as Instagram and Youtube—has boosted the public’s appreciation of the varied crafts and skills that undergird the industry. They have helped educate a wide audience on the complex processes of fashion production—engendering a shift in popular perception without which Hair by Sam McKnight might not have been conceived. Beautifully curated, the show invites viewers to glimpse the different spaces of fashion: the catwalk, backstage, the photographer’s studio, the archive, and even Instagram. These lively installations contribute to our understanding of how hair is made and perceived in different contexts, which in turn bolsters our appreciation of McKnight’s abilities. Take the very first room for instance, where viewers are introduced to the exhibition’s subject. The visitor is greeted by two adjacent displays; a multi-tiered case lined with the many tools a hair stylist must cart to and from assignments (products, gadgets, extensions, brushes of all shapes and sizes), and a back-lit vitrine featuring an aestheticised display of combs. They seem apt metaphors for hair styling as the creation of organised chaos. The exhibition cleverly illuminates the many skills that enabled McKnight to become one of the most sought-after session stylists. Its themes relate to both professional and personal achievement such as Intimacy, Storytelling, Transformation, and Movement. A section dedicated to Collaboration highlights McKnight’s career-defining creative partnerships with make-up artists Val Garland and Mary Greenwell, photographers Patrick Demarchelier, Nick Knight, Tim Walker, and with editors Lucinda Chambers, Edward Enniful, and Carine Roitfeld. Each figure is identified by small tokens of their profession—a thoughtful curatorial touch that complements blown-up images with personal memories of working with McKnight. The theme of collaboration extends beyond this room and emerges as the exhibition’s common thread. It is especially relevant to sections that examine McKnight’s work with Karl Lagerfeld and Vivienne Westwood. Installed at opposite ends of Somerset House’s Embankment Galleries, they illustrate the session stylist’s remarkable ability to adapt to different creative visions. 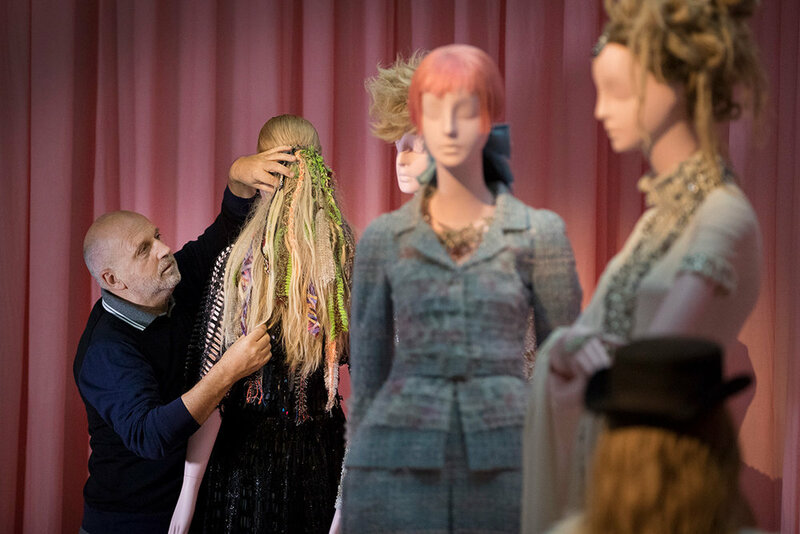 Wigs are partnered with original catwalk pieces to demonstrate just how important hair is to complete a “look” through a play on proportions, motifs, and the spirit of each collection. Both installations are accompanied by recordings of the original shows—a pairing that allows visitors to simultaneously admire details on static mannequins and to see each outfit in motion. While newspaper clippings contextualise McKnight’s collaboration with Vivienne Westwood, the hair stylist’s partnership with Karl Lagerfeld is complemented by the latter’s sketches. These strategies allow visitors to consider the development as well as the afterlife of the catwalk looks they encounter. The sections ‘Pop Icon’ (focused on Lady Gaga) and ‘The Princess’ (centred on Diana, Princess of Wales) also speak to McKnight’s ability to collaborate on both a professional and personal level. The emphasis on two influential clients invites viewers to consider how hair relates to public and private constructions of identity. This concept is especially salient to the display that concentrates on the late Princess of Wales. Some might be surprised to learn that McKnight was responsible for Diana’s drastic hairstyle change in the mid 1990s, an episode that received extensive media attention and preceded her divorce. In retrospect, the princess’s short, feathered haircut appears as a conscious move to shed the royal public persona forced on her in search for a more modern, personal identity. In an accompanying quote McKnight states “I wanted to try something different, but I didn’t want to push her. It was a great success.” The hair stylist’s skills and ability to put clients at ease is thus linked to a moment that has become part of collective memory. Within this context hair is framed as both popular and personal. The overlap between the two is also suggested in other parts of the exhibition, such as the newspaper coverage of Agyness Deyn’s pixie cut, which sparked a trend in the late 2000s. It helps put McKnight’s influence in a wider perspective, beyond glossy fashion magazines and into the public realm. The convergence of public and private is also addressed in the final section of the exhibition. Labelled “Now,” it showcases some of McKnight’s recent work against a wallpaper of square-sized images posted on the stylist’s Instagram feed. Flowers from his garden, be-wigged selfies, snapshots from behind the scenes are portrayed as components of an organic, interactive archive. Conceptualising social media as a creative platform and as branding tool, the display acknowledges its impact on the fashion industry: in widening access to previously unseen processes and spaces, images, and videos allow the construction of new, more personal mythologies. The exhibition is accompanied by a short catalogue that includes essays by Shonagh Marshall, Becky Conekin, Caroline Cox, Lou Stoppard, and McKnight’s archivist Tory Turk. Illustrations of key pieces by The Unskilled Worker and photography of the archives by Gareth Powell animate the texts, which offer further context on the show’s themes and provide insight into how the retrospective was developed. Rizzoli has also published a comprehensive volume of the hair stylist’s forty year career to coincide with the exhibition, titled Hair by Sam McKnight. It includes a wealth of images, essays by Tim Blanks, Alexander Fury, Amanda Harlech, and Nick Knight, as well as commentary by McKnight himself. Hair by Sam McKnight is a remarkable show in many respects. As one of only a small handful of retrospectives to concentrate on the work of a hairstylist, it celebrates an influential yet hitherto underrated profession. In doing so, the display takes visitors behind the scenes and invites them to appreciate the work that goes into creating powerful fashion images. Thanks to Michael Howells’ beautiful exhibition design and Shonagh Marshall’s careful edit of content, McKnight’s personal archive comes to life and tells a compelling story about the relationship between hair and fashion. This could have easily resulted in a boring or even chaotic display. Instead, a glut of materials, from hair extensions to press clippings, make the show interesting and enjoyable throughout. Hair by Sam McKnight at Somerset House’s Embankment Galleries is on display from 2 Nov 2016-12 March 2017.